Yes. Following the course, you will receive an email from a member of our training team with a certificate showing your completion of the course. As our certificates are produced manually, please allow 2 business days for us to process the certificate. For life. We are constantly improving the modules in the course, whether that is adding in a new case study, new follow on reading options or improving our delivery based on student feedback, so why should you miss out on those updates just because you bought the course before we made those improvements? We don’t think you should and we don’t think you should have to pay a recurring fee to access those improvements in this lecture-based course either. So the cost of the course includes life time access. 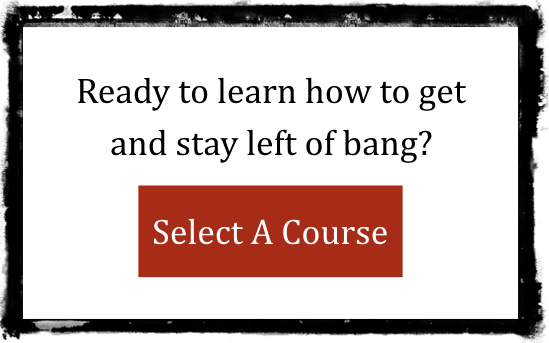 I read Left of Bang, do you recommend that I also take the course? First, thanks for reading Left of Bang, but second, that decision is up to you. We’ve heard that some people like getting to see pictures and videos of each behavior that we discuss and that reading the book before the course makes the student feel like they are taking their understanding of human behavior to the next level. But here is what is different between the book and the course. We’ve evolved how we teach the behaviors in the course and teach them now as 4 Pillars as opposed to the 6 domains written about in the book. We’ve improved how we teach the baselining process to have a more in-depth look at how to conduct a hasty search and a deliberate search. We’ve added in new case studies and examples of how to observe behavior and how it can help to get left of bang. Do you offer in-person training seminars? Yes, but rarely. For organizations who want the training customized to their unique situation and are using the Tactical Analysis/Left of Bang concepts to make improvements to their existing security and force protection procedures, you can learn more about our training seminars by clicking here. Yes. The Tactical Analysis course we offer through our website is how many of our most engaged clients choose to learn how to get left of bang and we are happy to offer discounted rates depending on how many students you would like to enroll. To get a quote, please reach out to us by filling out our “Contact Us” form and we will follow up to find a time to talk. Can I see a portion of the course for free? Yes and we encourage our students to watch the first two modules before they buy to make sure that it is what they are looking for. To see the sample lessons, take a look at our Tactical Analysis “Course Description” page.